Premium Combo is one of our artistic creations. 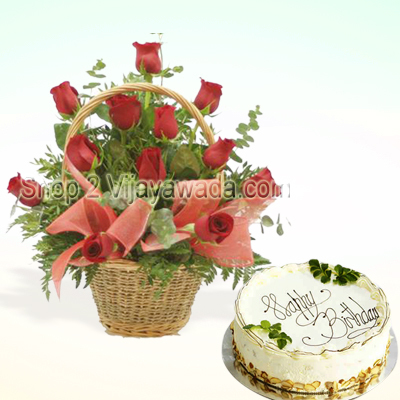 It comprises of 24 red roses which is paired with 1kg cake in the flavor of your choice. Our creative florist has come up with this innovative idea for a stunning arrangement of roses in a round basket. Greenery and fillers are added to make the flower arrangement even more beautiful. Our Premium Combo is ideal for any occasion and makes an ordinary day special. Send roses bouquet online and let our fresh blooming flowers convey your warm feelings. The Premium Combo is most suitable for birthdays, anniversary, retirements and other special events in the life of your friends and your loved ones.